Home » Resources » WHAT ARE PP HONEYCOMBS? Industries involved in construction and fabrication face various challenges today, especially concerning the base materials used in erecting a particular structure. Companies around the world are on the lookout for new and improved composite core materials that can lend affordability, reduced weight, and enhanced performance to the construction projects they are used in. Enter PP Honeycombs – a revolutionary product that checks out all the strength and resilience requirements that a construction company might be looking for. If you haven’t heard about this wondrous new material, read on to discover what PP Honeycombs are and how they can be of use to you. 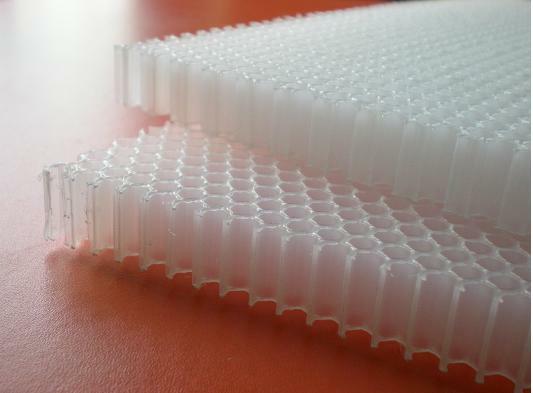 PP or Polypropylene honeycombs are mainly used as the core for manufacturing sandwich components for construction projects. Made from Polypropylene, a recyclable thermoplastic from the polyolefin group, this material’s hexagon-shaped cells or honeycombs provide it with some astonishing properties like high tensile strength, mechanical memory, resistance to corrosion, rot, and decay, fatigue resistance, excellent compressive and shear strength, impact resistance and shock absorption along with good thermal insulation. But the best part about PP Honeycombs is its weight. This material is lighter than water! In fact, it is so light that it can remain buoyant in water and various other fluids. This amazing strength to weight ratio is what makes PP honeycombs such a revolutionary and useful composite core material for all kinds of construction applications. Where are PP Honeycombs used? Marine: For manufacturing ship hulls, decks and bulkheads. Automotive: For the paneling in doors, floors, and roofs and for enhanced shock absorption. Windmills: To manufacture blades, spinners, and housings. Building construction: For the paneling in doors, walls, floors, roofs and laminated cladding. Packaging: For manufacturing, reinforced casings. Industrial: For the construction of floating roofs and docks, bridges, chemical tanks and platforms. Miscellaneous: In surf boards, signage display panels, kayaks, canoes, and other weight sensitive constructions. PP Honeycombs combine strength and resilience in an ultra-lightweight package which is perfect for use in a huge variety of construction and fabrication applications. If you belong to any of these industries and are looking for a reliable composite core material, make sure you consider PP Honeycombs for your requirements.